Alyssa Grimm is one proud mama – and rightly so. Alyssa’s daughter, six-year-old Adisyn, has a thing or two to teach all of us grown-ups about selflessness and generosity. In the year leading up to Adisyn’s sixth birthday, she repeatedly told her mom about her plans for her next birthday party. No Disney Princess or Barbie-themed shindigs for this little one. She wanted a “Dogs and Cats” party. In lieu of presents for herself, she wanted to help the animals at the Beaver County Humane Society. Blown away by her daughter’s thoughtfulness, Alyssa complied…and found, when asked, people are more than willing to jump in and help those in need. I had the extreme pleasure of meeting Adisyn recently and took that time to ask her about the party and how she came up with the idea to help the animals. First, Adisyn and her brother and sister are no stranger to animals. Their household includes two dogs, Louie and Bentley, a cat named Fuzz, three fish and three hermit crabs. Adisyn is actively campaigning for either a kitten or hamster to add to the mix. Second, this love of animals has always extended to those outside her household as well. On shopping trips, mom and daughter will grab a thing or two at a time – pet toys or cleaning supplies for example. Once they’ve amassed a bag full, they take the donation over to the Humane Society and visit with the animals. So, when dreaming of her next birthday party, Adisyn decided to get more people to share in her love of animals by providing them with the things they need. When asked why she wanted her guests to bring presents for the animals rather than for herself, the answer, quite simply, was that they needed them more than she did. Fast forward to the big event! Invitations went out, describing Adisyn’s wish that her guests help the animals at the Humane Society by bringing donations instead of gifts. When asked what they should bring, Alyssa directed friends and family to the Humane Society’s wish list…food, toys, kitty litter, blankets, cleaning supplies and office supplies. Mom hunted down a birthday banner printed with dogs and cats. Small plastic pets topped the cake. The day of the party, about 20 kids came to celebrate…bringing with them all that had been asked for and more. After the gathering, a very grateful Humane Society received the truckload of donations delivered to them. 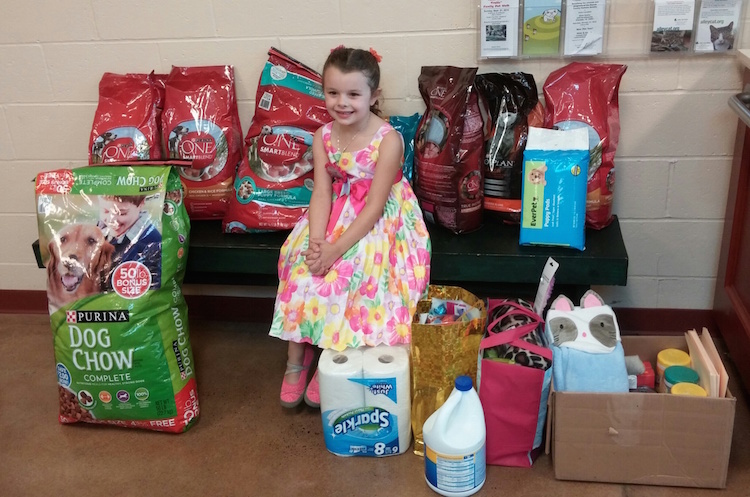 Adisyn’s birthday wish didn’t only benefit our Beaver County Humane Society…family members too far away to travel to the party gathered supplies and donated to their local rescue organization. Alyssa Grimm was – and continues to be – both proud and amazed that her daughter, without persuasion from any adults, has this kind of charitable instinct. 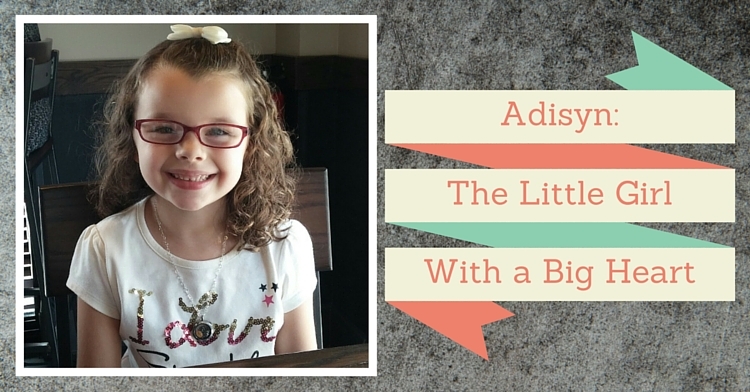 She wondered…are there other kids out there, hoping to effect change the way Adisyn does? Turns out – there are. Over dinner with my BFF the other night, she mentioned that her 11-year-old, Samantha, saves money specifically to donate to the Humane Society. Once she’s saved about $20, she asks mom to drive her over to make the donation in person, where she explains to the staff at the front desk that she’s brought it to help the animals. Of course, I’m quite sure our youngins in Beaver County are more special than those anywhere else in the world, but check out some of the charities listed here. At four years of age, Alex Scott set up a lemonade stand to help doctors find a cure for cancer. At eight years of age, Hannah Taylor founded the Ladybug Foundation, raising money to help provide shelter to the homeless. There is indeed a movement of children performing charitable acts out there. At the end of our meeting, I asked Adisyn what she wanted to tell people, what she hoped people had learned from her. She wants kids to know they can copy her birthday party. Imagine if everybody had parties to help out someone else in need! Also, she thinks people should take the animals at the Humane Society home – but ONLY if they can take care of them. And I would like to tell the Adisyn’s and Samantha’s of the world to please, please keep doing what you’re doing. Life will be better because of it. I am going to have to concur with the late, great Whitney Houston – I do indeed believe the children are our future. I spoke with Alyssa Grimm before posting this article…she wanted me to know that after she and Adisyn left our meeting, they went to Pet Smart for Fuzz’s litter. Hannah, a ten-year-old cat, came home with them! Before donating to the Beaver County Humane Society, please read their wish list here, as they have need of specific food brands and types of toys. Monetary donations and gift cards are also greatly appreciated. Abby is a life-long resident of Beaver, so she is thrilled to be a part of this project. She loves this little town of ours! She lives in Bridgewater with her husband, Matt, and their favorite topics of conversation, their dog, Mabel, and their black cats, Ozzie & Gus. When she’s not busy hunting down stories to entertain you guys, she can be found with her nose in a book…or eating ice cream…or both. Usually both.  Archived in Profiles, Uncategorized and tagged birthday, humane society.